Crystal lattice is the depiction of three dimensional arrangements of constituent particles (atoms, molecules, ions) of crystalline solids as points. Or the geometric arrangement of constituent particles of crystalline solids as point in space is called crystal lattice. Each constituent particle is represented by one point in a crystal lattice. 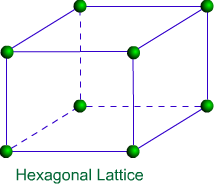 These points are known as lattice point or lattice site. Lattice points in a crystal lattice are joined together by straight lines. By joining the lattice points with straight lines the geometry of the crystal lattice is formed. Unit Cell: The smallest portion of a crystal lattice is called Unit Cell. 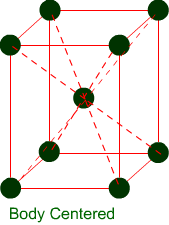 By repeating in different directions unit cell generates the entire lattice. A unit cell is characterized by six parameters. These parameters are three edges (a, b and c) and angles between them (α, β and γ). 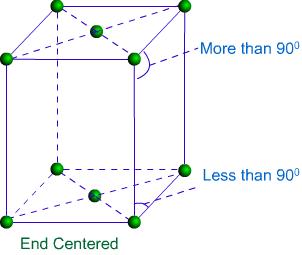 Dimensions along the edges of a unit cell is represented by a, b and c.
Edges of unit cell may or may not be mutually perpendicular. The angle between b and c is represented by α, between a and c by β and between a and b by γ. Types of Unit Cell: There are two types of unit cells – Primitive and Centred Unit Cells. 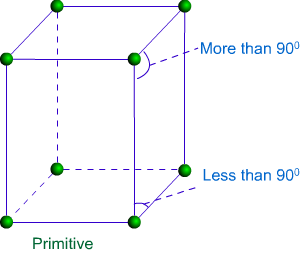 Primitive Unit Cells: When particles in unit cell are present only at the corners, it is called the primitive unit cell. Centred Unit Cells: When particles are present at other positions in addition to those at corners in a unit cell, it is called a Centred Unit Cell. (a) Body Centred Unit Cells: If one constituent particle lies at the centre of the body of a unit cell in addition to the particles lying at the corners, it is called Body-Centred Unit Cell. 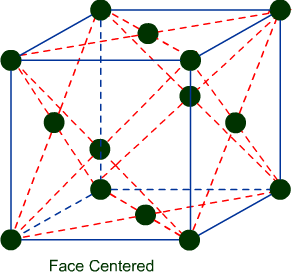 (b) Face-Centred Unit Cells: If one constituent particle lies at the centre of each face besides the particles lying at the corner, it is known as Face-Centred Unit Cells. (c) End-Centred Unit Cell: If one constituent particle lies at the centre of any two opposite faces besides the particles lying at the corners, it is known as End-Centred Unit Cell. It is also known as base-centred unit cell. There are seven types of unit cell formed. These are Cubic, Tetragonal, Orthorhombic, Monoclinic, Hexagonal, Rhombohedral or Trigonal and Triclinic. There are only 14 possible crystal lattices, which are called Bravais Lattices. Cubic Lattice There are three types of lattice possible for cubic lattice. Primitive or Simple, Body centred, Face centred lattices. 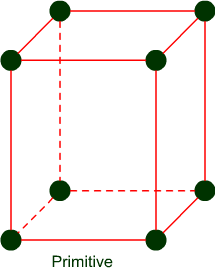 In these types of lattices all sides are of equal length. The angles between their faces are 900 in a cubic lattice. Tetragonal Lattice There are two possible types of tetragonal lattices. Primitive and Body centred unit cells. In these lattices one side is different in length and angles between faces are equal to 90°. 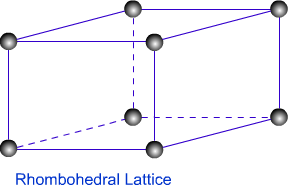 Orthorhombic Lattice Four types of orthorhombic lattice are possible. They are Primitive, End-centred, Body centred and Face centred. They have unequal sides. The Angles between their faces are equal to 90°. Monoclinic Lattice There are two possible types of monoclinic lattice. They are Primitive and End centred. They have unequal sides and two faces have angles other than 90°. Hexagonal lattice Hexagonal lattice is of one type only. It has one side is different in length to the other two and the angles on two faces are 60°. Rhombohedral Lattice Only one type of lattice is possible for Rhombohedral lattice. It has all sides equal and angles on two faces are less than 90°. 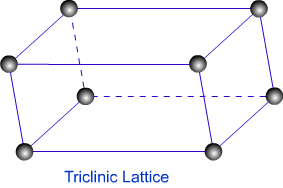 Triclinic Lattice Triclinic lattice has only one type of lattice. It has unequal sides and none of the angles between faces are equal to 90°. 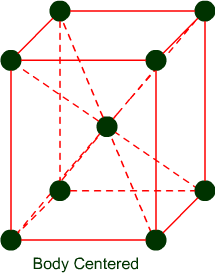 A crystal lattice is made of very large number of unit cells and lattice points are the representation of constituent particles. Therefore, the number of atoms in a unit cell of a crystal lattice can be calculated. In primitive unit cell, atoms are present at corners only. 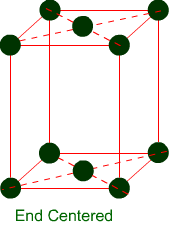 In a crystal lattice every corner is shared by eight adjacent unit cells. Therefore, only 1/8 of an atom, or other constituent particles, belong to a particular unit cell. 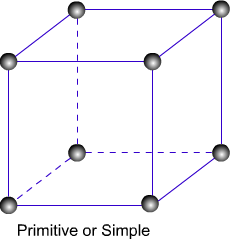 Thus, 1 atom is present in a Primitive Cubic Unit Cell. 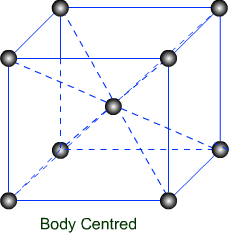 Body Centred Cubic (bcc) Unit Cell – There are eight atoms at each corner and one atom present at the centre of body in a body centred cubic (bcc) unit cell. 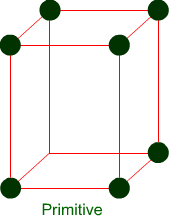 In a face centred cubic unit cell, there are eight atoms present at each corner. A cube has six faces, therefore total six atoms are present at the centre of each of the face. Each atom present at corners is shared by adjacent eight atoms and each atom present at the centre of face is shared between adjacent two atoms.